This blog was kindly written by Dominic Lewisohn. Dominic has spent this week volunteering for Galapagos Conservation Trust – writing this blog, assisting with the photo competition and helping create a video. Waved albatrosses, endemic to Galapagos, have the largest wingspan of the birds in Galapagos making them one of the most majestic birds to see. With wingspans of up to 2.5 metres and an average weight of 3 kilograms, these albatrosses spend most of their lives gliding above the open ocean. 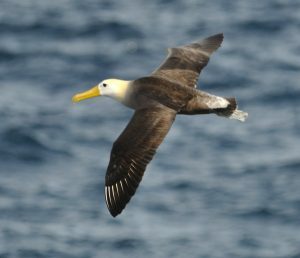 A 50 year old albatross will have flown at least 6 million kilometres! Waved albatrosses have a creamy yellow neck and head, and mostly brown bodies with slightly blueish feet. They have wavy patterns along their wings giving rise to their name. Most albatrosses have a lifespan of 40-45 years. These birds mainly feed on fish, crustaceans and squid, as well as smaller birds, by diving graciously into the sea. 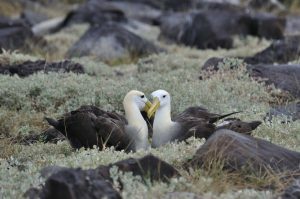 During breeding season, waved albatrosses always return to Espanola island for mating. Albatrosses are extremely loyal and stay with their partner for life. During this hectic time, albatrosses find their partners through the courtship dance, wherein each couple has a different dance that they perform which they learnt when they first courted each other. Eggs are laid from April to June and the couple take it in turns to incubate the egg for up to two months until the egg hatches. A few weeks after hatching, the parents leave their chicks in “nursery” groups allowing both parents to find food for their chick. Parents are able to fly more than 16,000 kilometres to gather food. By January the next year, the offspring eventually leave the colony and spend the next six years out at sea before returning home to the Islands to find a mate. Although the population of waved albatrosses is between 50,000 and 70,000 with around 12,000 breeding pairs, they are critically endangered. This is due to each couple only laying one egg per year which means that population growth is very slow and that the species is especially vulnerable. However, the greatest threats to these amazing birds come from men. Longline fishing causes many albatrosses to drown after being hooked on baited hooks. Although longline fishing in Galapagos has been banned, outside this area there is no protection for these birds. Disturbance via tourism, disease and illegal fishing also affects these birds, resulting in a decreasing population. Categories: Sustainable Galapagos, Wildlife of Galapagos | Tags: albatross, bird, critically endangered, endangered, endemic, seabird.